Click here for more great photos our events. 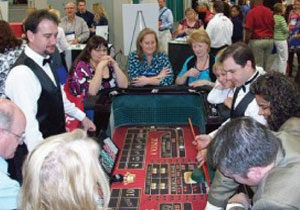 Casino Party USA will help you run a successful casino theme party fundraiser with our staff not only providing management of the casino games, but also great ideas for contests, raffles, drawings, and other ways to boost your charitable contributions. Many clients hire not only Casino Party USA for their events but, specifically ask for several of our staff to emcee and host the event. Make Note: Due to legal issues surrounding “charity gaming”, not all laws apply in each state. Please contact our office for a discussion on your upcoming event and how we can raise money, and fun, for you.